Most of you know that I lost my babydog Patches in September. I NEVER thought I’d get another dog, but I did say that if I found a Puppy Mill survivor, I’d gladly adopt her/him. My son and I have been looking for a few weeks, and finally on Wednesday, the 13th (which btw was my oldest son’s birthday) I did find one, and did adopt her. Another thing I kept saying was that I wouldn’t adopt any dog that looked in any way like Patches. And Desi definitely doesn’t. This is Dessabell (we call her Desi). Isn’t she adorable? 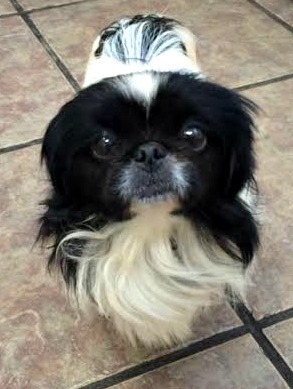 I’ve never had a really small dog and would not have gone looking for a Pekingese (we found out she’s actually a Japanese Chin) but a shelter in Sarasota had a bunch of puppy mill dogs and when I saw her I knew she was the one I wanted. 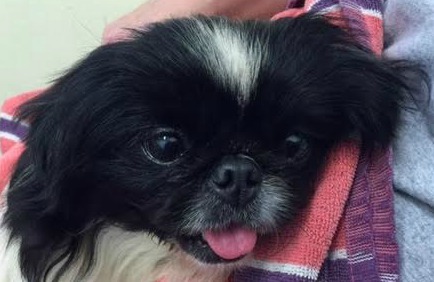 Desi was found in a puppy mill that a woman had at her home, and was one of 250 dogs. I just don’t understand how anyone could harm an innocent animal. So horribly sad! Anyway, I kinda felt like I was…(don’t know if betraying is the right word) but I did feel a lot of bad/sad thoughts about getting another dog because of Patches, but I knew she would want me to rescue this broken doggy. My son and I took Desi to the vet yesterday just to make sure she was doing ok because she was spayed the day before we adopted her, and also to get more detailed information on her health than we got when we adopted her. She does have a few missing teeth, had two ticks and some fleas, but that’s pretty much it other than underweight from not being fed enough. I plan on getting her groomed toward the end of the month, as soon as her stitches heal. She just turned 2 years old on Dec. 31st. The longer a dog is in a puppy mill the worse their health is. She doesn’t walk around much because of being in a small cage with other dogs and not having room to walk around. She was living in a cage and not being taken outside, and hasn’t figured out grass yet. It’s a new feel, new smell etc. And she still can’t hold much food at a time, but all these things will improve with time. She is starting to wag her tail when we go near her or talk to her. She’s never been on a leash, so doesn’t quite know that she’s supposed to walk so we have to work on that, plus (something I never thought of) even though she’s 2 years old, she was never taken outside to potty, so she isn’t housebroken. Oh me! Thank God I have a really really powerful shampooer, lol! It’s been 17 years since I had to potty train Patches, so I hope this goes well. She has quite a few things in common with Patches. Not laying with their whole body on her bed, picking a piece of food out of the food bowl and laying it on the floor then picking it up again to eat it, love getting rubbed on the head. So far that’s the only things that they both have in common but I’m sure I’ll notice more as time goes by. I kinda think Patches led me to this dog. They are so much alike. If any of you have any tips or advise as far as helping a puppy mill dog acclimate to living with a family and being a part of the family, I’d be very thankful. Desi has been through so much and I want her to know that there are people who will love her and never starve or be mean to her. I still haven’t gotten over the loss of Patches and not a day goes by that I don’t think about her and shed a tear for her (and her daddy Henry) but today when I was holding Desi and talking to her, a thought popped into my head that really clicked in my brain. “We’ll help each other heal”. That was such an “aha” moment and it sure did bring on the leaky eyes, but I know that’s what we’re doing. Helping Each Other Heal. As you probably know, I am not a huge animal person. However even I couldn’t fail to be moved by those ‘Puppy Farm (Mill)’ images, in fact I just couldn’t bear to look at all of them! Of course she can never replace Patches or his Daddy, but if she helps to heal the wounds and fill that empty space just a little, then it will all be worthwhile. Congratulations! Desi is ADORABLE!! I, too, believe that Patches led you to Desi. I am so happy for you! Housebreaking requires ample patience, and sometimes a lot of time, but dogs are able to learn. Hopefully, Desi will get healthier and adjust to her wonderful new home. I wish you all the best with your new baby! I am so happy for you. This will be great for both of you. Thank goodness there are decent people like you I the world to help these poor animals. We have always gotten our dogs from a rescue organization as they are the ones in such need. I wish I had advice for you but it’s been ages since we had a puppy. I know there must be advice sites on the web about acclimating a puppy mill dog. She’s gorgeous, Vicki. Desi is adorable! Best wishes for you and her. I’m sure Patches is proud that you opened your home to a dog in need like that. I’m sure Desi is going to be a wonderful dog for you. Congratulations! Oh what a sweet face! I can see why she was the one! She looks like she has tons of personality. I’ve never dealt with a puppy mill survivor but we had a greyhound that had spent her entire life on the track and it sounds like there are some similarities in how they’re treated. If you don’t already have one I highly recommend a crate. Our greyhound had extreme anxiety when left alone and a crate was really calming for her and helped her feel safe because that’s what she was used to. After seeing how positive it was for her I’m a definite crate training supporter. Who could resist that little sweet face? Such a cute puppy. And I think you are right – you will help each other heal. Desi needs you and will give you unconditional love. So happy for you, Vicki! Darling Desi!! She’s a cutie patootie! Wish I could have a dog too, but my hubby says no, not again! I am sure you will enjoy him. There are puppy training sheet/pads at the pet stores that you can use to potty train indoors. They do work, if you want to try that. Good luck and have fun with Desi! She’s a beautiful dog. Congratulations and I hope things continue to go well with her. are there for her no matter what. Be patient and let her come around slowly. I have always found that it is the animals that guide us as long as we are patient. grateful. Rest assured, she is meant to be there. Best wishes for a long and loving relationship. This is so great for you AND Desi! Very happy for you Vicki and what a great thing you are doing by taking on a dog who is so behind other dogs. I know behind isn’t the right word, but I just mean that she is going to take extra work. It already sounds like you’ve bonded and she is adorable 🙂 We had our first cat, Scout, for 16 years, and it’s only been in the last week or two that I’ve been able to cuddle my kitties and not think of Scout or compare them in some way. Looking forward to more Desi pics! I know how you feel. I was heartbroken when I lost my cocker Beatrice (only 8 years old). I waited over a year before I had the heart to adopt another dog. We went to the shelter and rescued Buddy. He was afraid of everything when we got him and flinched at every move or loud noise. Every dog is different and has a unique personality and we can always find it in our hearts to love another and another. They lead such short lives but their love is so perfect.